New Delhi, April 2: With the Board of Control for Cricket in India (BCCI) ombudsman D.K. Jain sending out notices to India all-rounder Hardik Pandya and opening batsman K.L. Rahul to depose before him in a pending enquiry following their inappropriate comments in a TV chat show, the board is looking forward to end the row keeping the World Cup in mind. Speaking to IANS, a senior BCCI executive said that everyone in the board is on the same page and feels that it is time that the issue was put to rest. They feel that the punishment cannot be bigger than the crime and the players have already paid for their mistake. "Everyone in the board feels that this issue needs to come to an end. The players committed a mistake and there is no two-way about it. But the players were sent home from the tour of Australia, they did apologise for their mistake and are also set to depose before the ombudsman. "With the World Cup round the corner, the general sentiment is that the matter should be put to an end," the executive said. 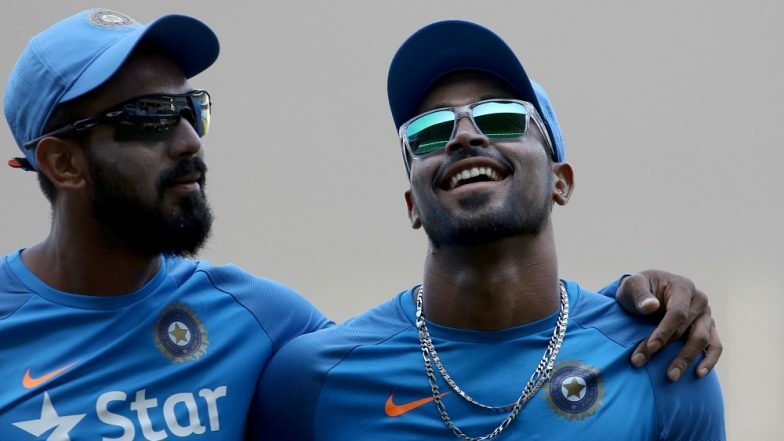 Will Hardik Pandya and KL Rahul’s Absence in Indian Team Post KWK 6 Controversy Be a Blessing in Disguise During 2019 Series Against New Zealand? Another BCCI functionary said that the ombudsman has been given the matter as priority and Jain will in all likelihood submit his report within a week of meeting the players. "There is no timeline as such, but everybody understands that substantial match loss has already happened and the punishment cannot be bigger than the crime. The ombudsman will in all likelihood submit his report within a week of meeting the players and getting their side of the story," the functionary said. In his apology to the BCCI, Pandya had written: "I made an appearance on the chat show where I have made certain statements without realising that these could be disrespectful and offend sensitivities of viewers for which I am sincerely regretful. I would like to assure you that there was no malice or any sort of ill-intent on my part to offend anyone or portray any section of the society in bad light. I made these statements in the flow of the show and had not comprehended the extent to which my statements would be found offensive." Rahul on his part wrote: "At the outset, I extend my unconditional heartfelt apology for this extremely unfortunate incident. I'm extremely ashamed and embarrassed since this has caused such disgrace and embarrassment to both, the BCCI and sport of cricket. I assure you that, I shall, in the future, act more responsibly and shall ensure that my actions befit my stature as cricketer and a public personality representing India and the BCCI, across the globe." The two players will meet Jain around the Mumbai Indians (MI) and Kings XI Punjab (KXIP) match in the ongoing IPL at the Wankhede Stadium in Mumbai on April 10.